Watchmen is an upcoming 2009 American superhero film directed by Zack Snyder. 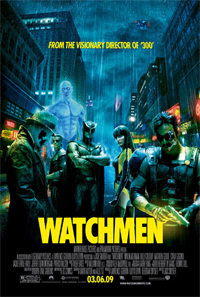 Based on the 1986 comic book limited series Watchmen by Alan Moore and Dave Gibbons, the film adaptation stars Patrick Wilson, Jackie Earle Haley, Malin Akerman, Billy Crudup, Jeffrey Dean Morgan, Matthew Goode, Stephen McHattie, Matt Frewer, and Carla Gugino. Set in 1985, the film follows a group of former vigilantes as tensions heighten between the United States and the Soviet Union while an investigation of an apparent conspiracy against them uncovers something even more grandiose and sinister. The film began shooting in Vancouver in September 2007 for release on March 6, 2009. As with his previous film 300, Snyder closely modeled his storyboards on the comic, but he chose not to shoot all of Watchmen using chroma key and opted for more sets. Following the series' publication, the film adaptation was mired in development hell. Producer Lawrence Gordon began developing the project at 20th Century Fox and Warner Bros. with producer Joel Silver and director Terry Gilliam, the latter eventually deeming the complex novel unfilmable. During the 2000s, Gordon and Lloyd Levin collaborated with Universal Studios and Paramount Pictures to produce a script by David Hayter (who set it in modern times). Darren Aronofsky and Paul Greengrass were attached to Paramount's project, before it was canceled over budget disputes. The project returned to Warner Bros., where Snyder was hired to direct (Paramount remained as international distributor). Fox sued Warner Bros. for copyright violation arising from Gordon's failure to pay a buy-out in 1991, which enabled him to develop the film at the other studios. Fox and Warner Bros. settled this before the film's release and Fox will receive a portion of the gross. A DVD based on elements of the Watchmen universe will be released; it will include an animated adaptation of the comic Tales of the Black Freighter within the story, starring Gerard Butler, and the documentary Under the Hood, detailing the older generation of superheroes from the film's back-story. An extended edition of the film, with Tales of the Black Freighter interspersed through the main storyline in a manner reminiscent of the comic, is forthcoming. (Credit: Wikipedia).